You've heard of TED—those conferences and lectures where interesting people talk about all the interesting things they're doing. Maybe you've seen a video online. Maybe you've seen us make fun of them. Whatever your opinion, TED is a huge thing—you don't get made fun of by the Onion unless you have arrived. The conferences have been happening since 1990, but TED has really taken off in recent years due to the increased visibility provided by the Internet; what used to be a relatively obscure conference in Monterrey is now a mega-successful YouTube phenom. And more. Much of this success has come under the stewardship of Chris Anderson, the current curator of the series of talks. He's here to take your questions. 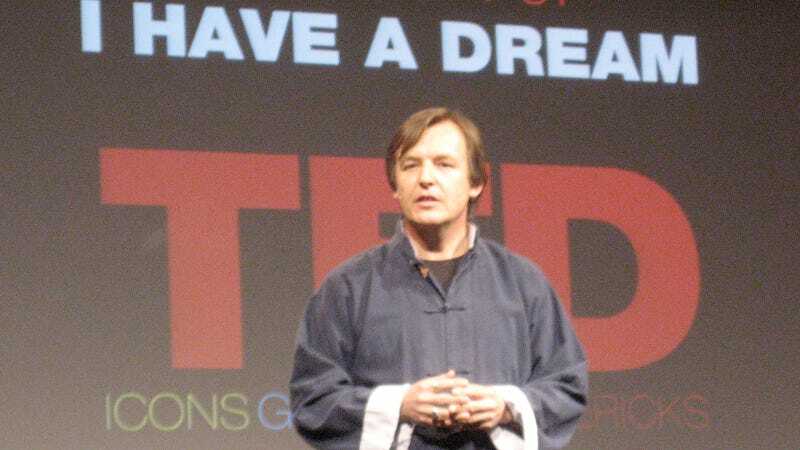 What's your favorite TED talk of all time? Chris: Hard question. There are so many. But today I'll go with this one from physicist David Deutsch. He asks a really strange question. What would a typical place in the universe look like? His answer gives one of those beautiful mind-shifts which are my favorite part of any TED Talk. By the time he's done you won't ever think of yourself and the earth and knowledge quite the same again. What's the fairest criticism of TED? Chris: Ouch! Let's see. Um. How can I pick from so many?! Well... in a few recent talks, TED speakers have been accused of coming across as canned. As going for emotional impact over actual substance. In some cases, the critics have a point. The reason it happens is that the TED platform now offers a successful speaker hundreds of thousands of views... or more. So there's huge incentive to get it right. Just occasionally, people try too hard to be smooth. Or to crack some perceived TED code. The thing is, it doesn't work. The only great talks are those where the speaker is authentic, and reveals a new understanding of something. We're absolutely alive to that critique and are making sure prospective speakers are too. Where is TED going? What will it look like in 10 years? Chris: Damned if I know. 10 years is a long time. Anyone who claims to have a 10-year road map in a world changing this fast, is fooling themselves. We think compass, not road-map. And the compass is simply our mission of "ideas worth spreading." Whatever new technologies come along that allow us to support that mission, we'll adopt. Something we're working on right now is how to better allow our online audience to help shape the ideas shared on the site. They shouldn't be thought of as delivered one-time in perfect form, one to many. They should be amenable to critical thinking, adaptation, improvement. Watch this space. OK, your turn. Whatever you do, don't mention Sarah Silverman. Or do—it's all fair game.